On Wednesday 28 September, 2016 the diocese of Waterford and Lismore held their Annual Pope John Paul II Award ceremony in the Glencomeragh House of Prayer, Kilsheelan, Co. Tipperary. 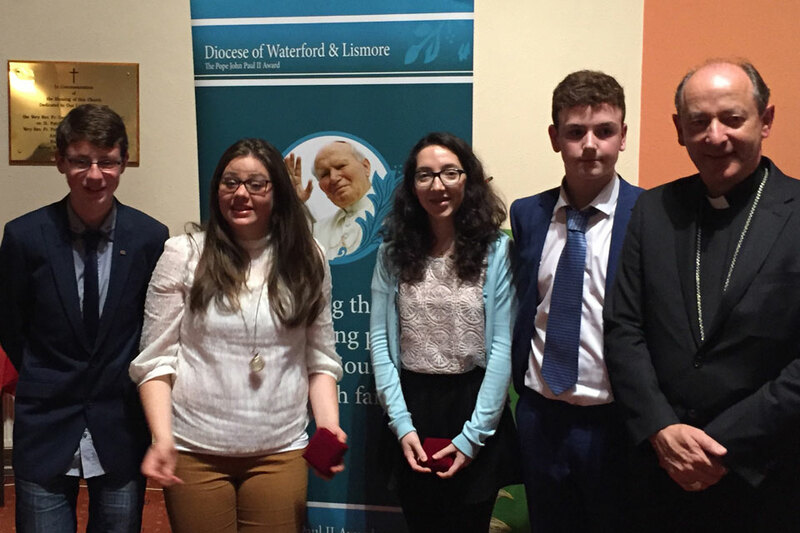 The Bishop of Waterford and Lismore, Most Reverend Alphonsus Cullinan presented the Award to 16 students from five different schools across the diocese. The schools awarded included Ardscoil na Mara Tramore, Coláiste Dún Lascaigh, Cahir, Waterpark and St Paul’s Community College Waterford, and Blackwater School in Lismore and Cappoquin parishes. The Award was launched in the diocese of Waterford and Lismore diocese by the Apostolic Nuncio to Ireland, Archbishop Charles Brown, in October 2014. Running in 21 dioceses throughout Ireland, The Pope John Paul II Award encourages our young people to get involved in their community and parish, and as part of our parish commitment to enhancing the lives of our young people on their journey through faith. The Award has been kindly and generously supported since 2006 with the help of the Knights of St Columbanus. Bishop Cullinan welcomed the students, their families and teachers, and mentioned the great work of youth ministry which is taking shape in the diocese. Diocesan coordinator of the Pope John Paul II Award, Fr. Michael Toomey, said he was literally ‘astounded’ at the enthusiasm and commitment all students have given and put into this Award. The Award allows students to assist in many parish and community ministries, and they in turn gain many experiences and talents, which enhance their spiritual and personal development. This year, the Award is being launched in secondary schools and parishes in and around Clonmel. Already over 30 students have begun their Award. Award enrolment forms and resources can be found at: www.thepopejohnpauliiaward.com/waterford-and-lismore or contact the Award leader in each school.